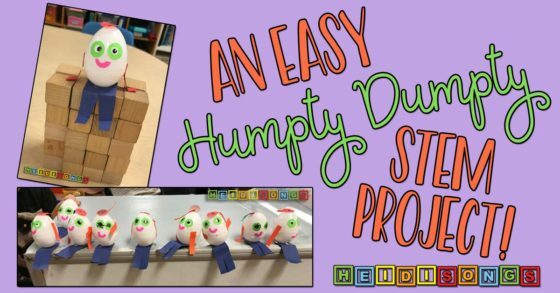 An Easy Humpty Dumpty STEM Project! 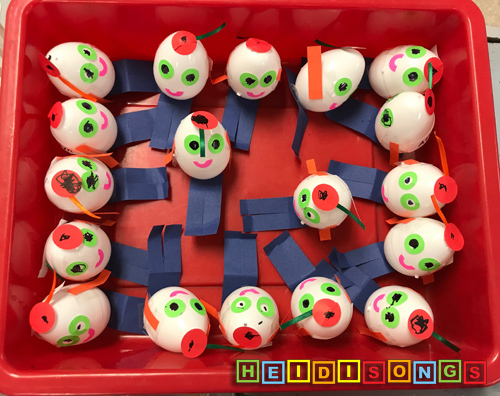 Here is a super fun and easy STEM project for your kindergarten, Pre-K, or first grade class that features a favorite nursery rhyme: Humpty Dumpty! So grab some extra plastic eggs and get ready for some Nursery Rhyme STEM Time fun! 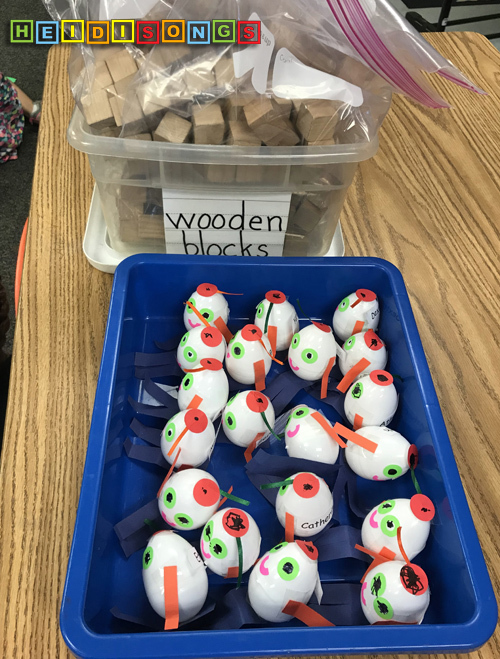 This project is actually one of many that I presented as part of my Nursery Rhyme STEAM Time workshop that I gave at the California Kindergarten Conference in Santa Clara in January, 2018, and the Southern California Kindergarten Conference in Pasadena in February, 2018 as well! I’m sure I will be presenting it again sometime soon, so keep watch on my Facebook or Instagram, or sign up for our email updates to find out where I’ll be next. And you can always ask your administrators to bring me to YOUR school! Email us at info@heidisongs.com to get more info on that! 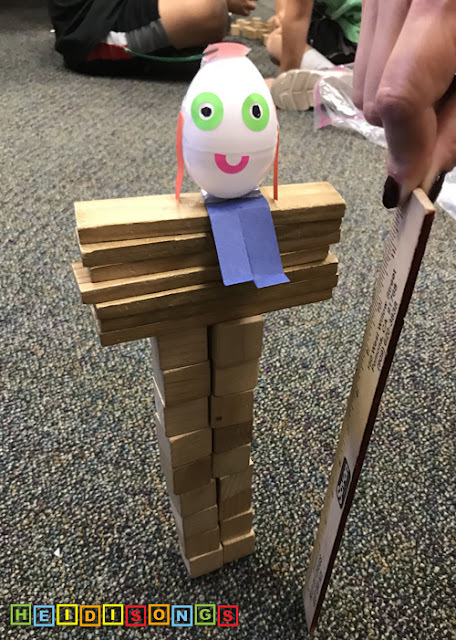 Then, my good friend, retired teacher, and faithful volunteer Sandy S. helped me create a Humpty Dumpty that would sit nicely on a block wall. It seems that the paper “pants” are the key to helping him sit up without falling down immediately! And we wanted the children to experience some success! You just have to fold them as the photos show so that the legs fold down over the side of the wall, and he sits up just fine. The arms also help anchor him a little bit, with the fold for the hands right where the bottom of the egg is! However as you can see, most of the children did not attach their arms with as much precision as we did, and they still sat up just fine, LOL! We attached both the pants and the arms with double stick tape. - Arms: Two strips of red paper, .5 inches by two inches. Attach with double stick tape. - Pants: One strip of blue paper, five inches by 1.5 inches (or nearly the width of your egg.) Cut a narrow triangle out of the bottom of the pants to give him the illusion of two legs, as shown. Attach with double stick tape. Decorate the eyes, hat, etc. with permanent marker. 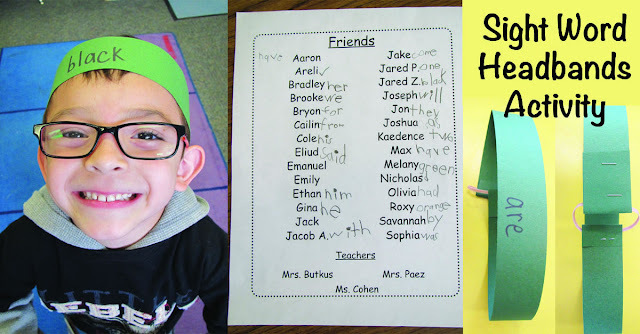 We printed names on return address stickers and attached them on the back. 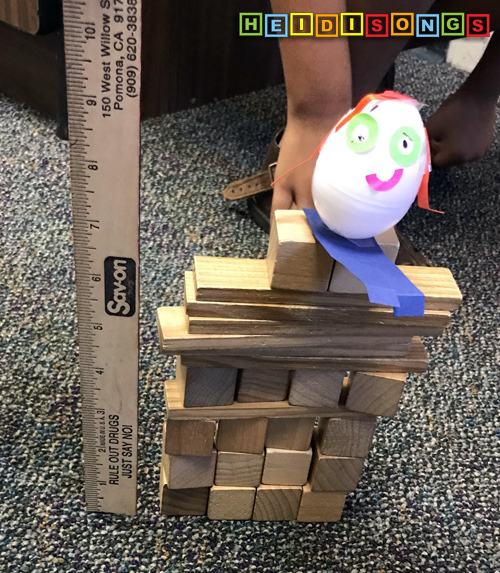 You may wish to make Humpty Dumpty on day one, and then do the STEM activity (make the wall) on day two! Making the wall for Humpty Dumpty is a cinch! 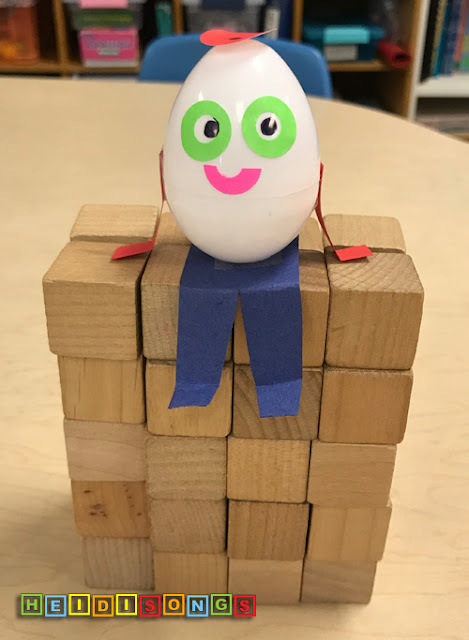 Every child in my room was successful; not one child was unable to make a wall for him to sit upon, and every Humpty balanced- at least for a few moments, anyway! 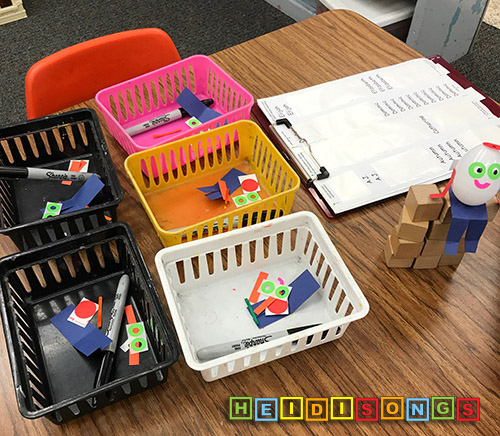 I chose to give my kids the challenge of making the tallest wall that they could make, given the same amount and type of blocks. I had the blocks all divided up equally in large zip bags ahead of time, thanks to my wonderful volunteers. 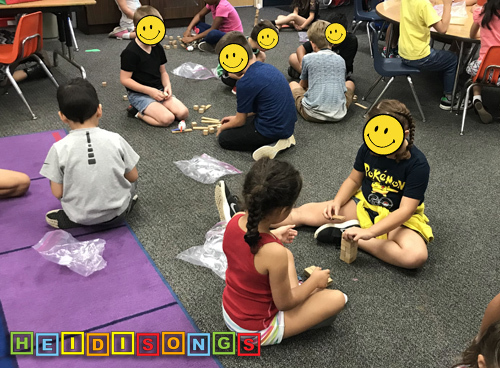 I hope you enjoy this activity as much as we did! Have fun! P.S. 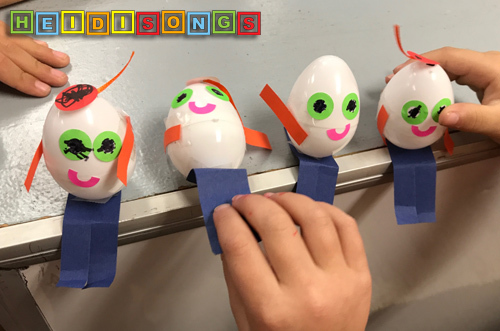 We have a Humpty Dumpty song on our Nursery Rhymes with Mother Goose CD and DVD!! 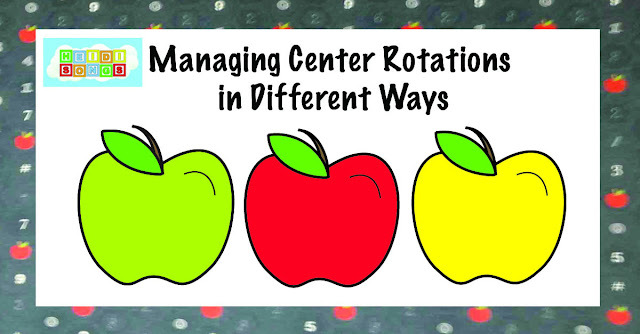 Watch this video! 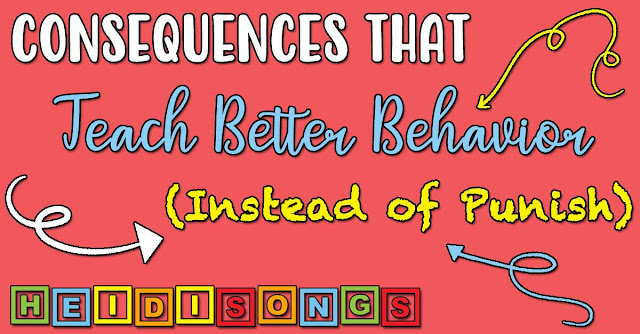 My kiddos STILL ask me to sing it on our way our the door as we go home nearly every single day!!!! When you’re SO excited about Humpty Dumpty you’re just about ready to POP! LOL! #kindergarten #prek #tk #nurseryrhymes link in profile!